Well, Cycon is just more than a week away – April 7-9 — and it’ll be a busy time for the many Indie writers (over 60) who’ve signed up as we put the polishing touches on our books and booths. I hope you made plans to join us next weekend to find great Indie writers. It’s a myth that Indie writers are terrible writers or that they’re folks who couldn’t get published through traditional publishing. In fact, many are great writers who just wanted more control over their books and don’t feel they want to give the lion’s share of profits to the folks who often did little more than print off the books. Traditional publishers also sometimes ruin a book by trying to make it fit a pattern they feel is more commercial. Traditionally published books are also much more expensive — so readers pay a penalty when writers decide to go the traditional route. If you’ve ever been to Comicon or other fan conventions, then you’re familiar with the format. Fans show up to see their heros in person, to get autographs, to learn more about the characters they love, and interact with other fans. Those Cons cost hundreds of dollars, between admission tickets, hotel and airfare, and costumes. Not to mention all the stuff for sale at the Con — from autographs to artifacts to paraphernalia. But, folks stand in long lines because they enjoy the rewards — both psychic and tangible in terms of the swag they pick up from booths throughout the fairgrounds. Well, Cycon is a cyber convention bringing together readers and Indie writers. Just like other Cons, there will be workshops and sessions, like Storytime, where readers can hear snippets from authors’ books read aloud. There are costume wars and lots of places to interact with Indie writers. Authors will give away free stuff at their booths, just like other cons. At my booth, I’m trying something unique and different. I’ve partnered with some other great Indie writers who let me give away their books at my booth, in addition to my own. The image above shows just a handful of the more than 20 books I’ll give away. Plus, there are postcards, book marks, and other stuff available for readers who drop by. Drop by my booth between 9 and 5 (EST) and let’s chat — and get some free stuff. Maybe I’ll even name one of the characters in my next book after you! 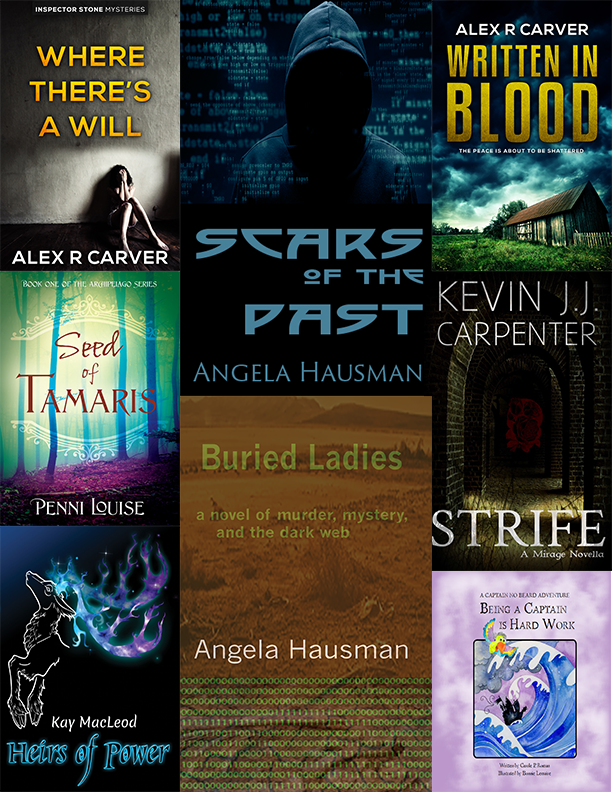 I’m in the Mystery/ Thriller Showcase! Tons of stuff. So much stuff we’re taking over 2 sites — Cycon and Goodreads. Check out the events. Some go on continuously, others are scheduled as specific times. And, get some rest. You’re gonna need it.